No words ring truer, nor are harder to accept than when you allow your life to be filled with the love of pets. 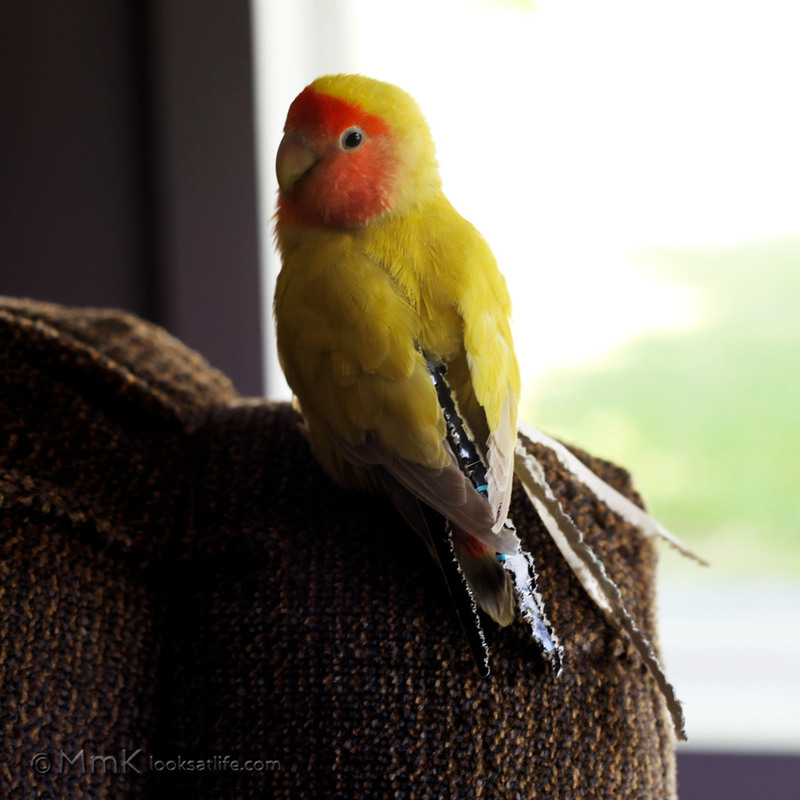 Furry, feathery, scaly... it doesn't matter: they come into our lives, fill our hearts with joy, and then leave us all too quickly. The unfairness of their much shorter life spans than ours is either a cruel joke from the Universe or a lesson to be learned. What that lesson is, I do not know. But any time I've dealt with the passing of a pet, I always tell myself 'no more' because I don't think I can get through the sadness. However, sooner or later some wonderful little Earth Angel finds their way into my life, healing past hurts, and showing me how to love with all my heart again. 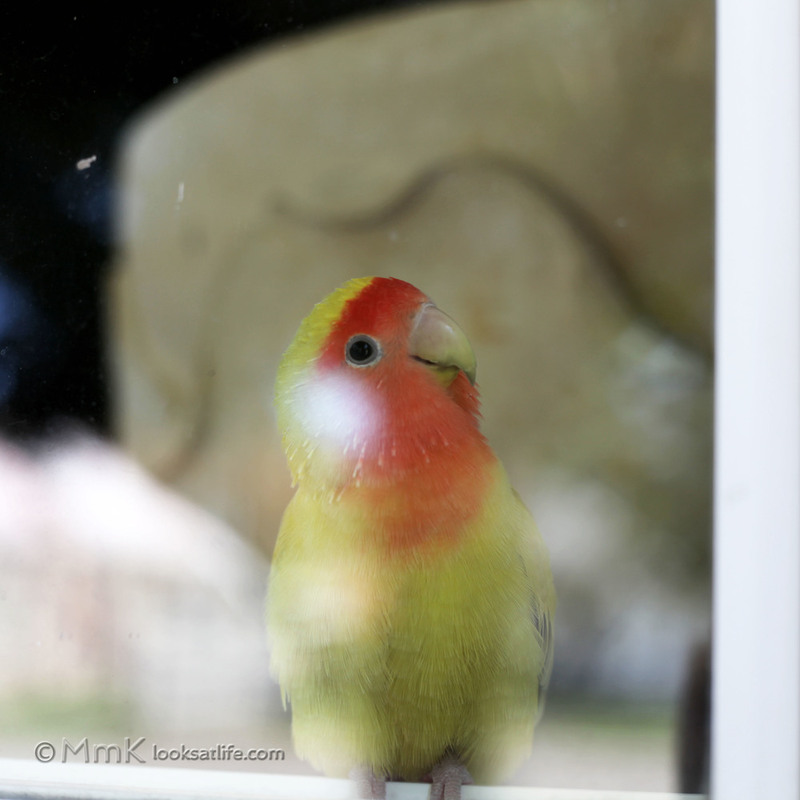 Love, in the form of a little yellow, peach-faced lovebird, came into our lives a couple winters ago. She was young, nameless, and without a family (the original owners gave her up because they didn't know how to care for her). Her temporary home was at a dog groomers. All she had to do was flap her little wings at me and put on her cute face when I walked through the door. It was a Thursday and I couldn't stomach thinking she'd be alone in the grooming salon over the weekend. She was a member of our family by Friday morning. 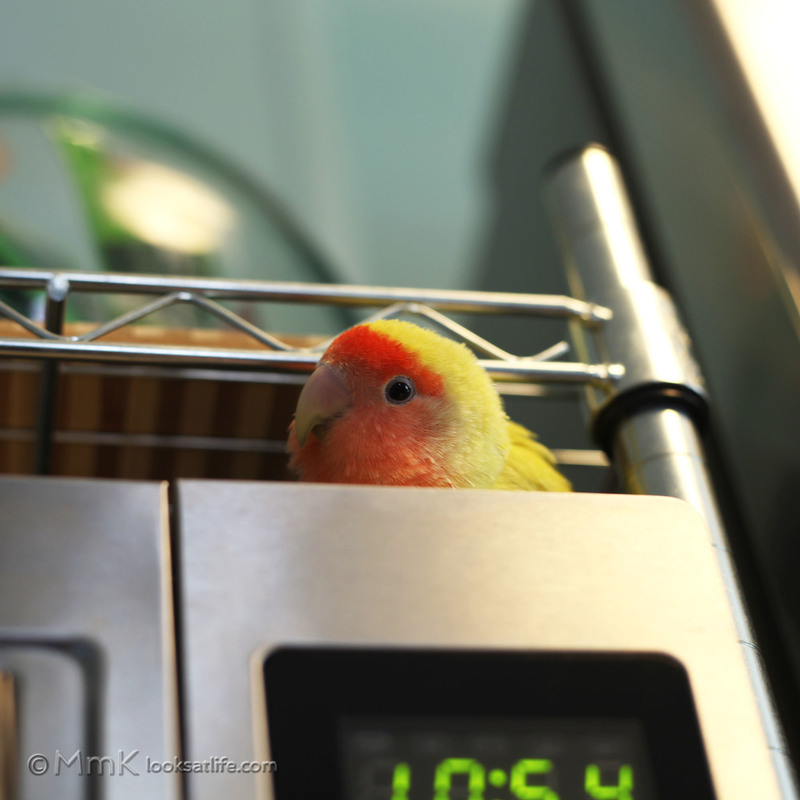 She was a bit shy - hiding in her happy hut after too much attention - and didn't make a peep for the first two weeks. Peach seemed like the perfect name for such a quiet and sweet little soul. Little did we know what lovebirds were all about. Lovebirds (one of the nine species of the genus Agapornis) are small, stocky, blunt-tailed, affectionate, and social parrots. Most people commonly think of them as a twosome, because so many are kept in pairs. But, this is not necessary for their survival and many birds (of many species) will bond with their 'people.' 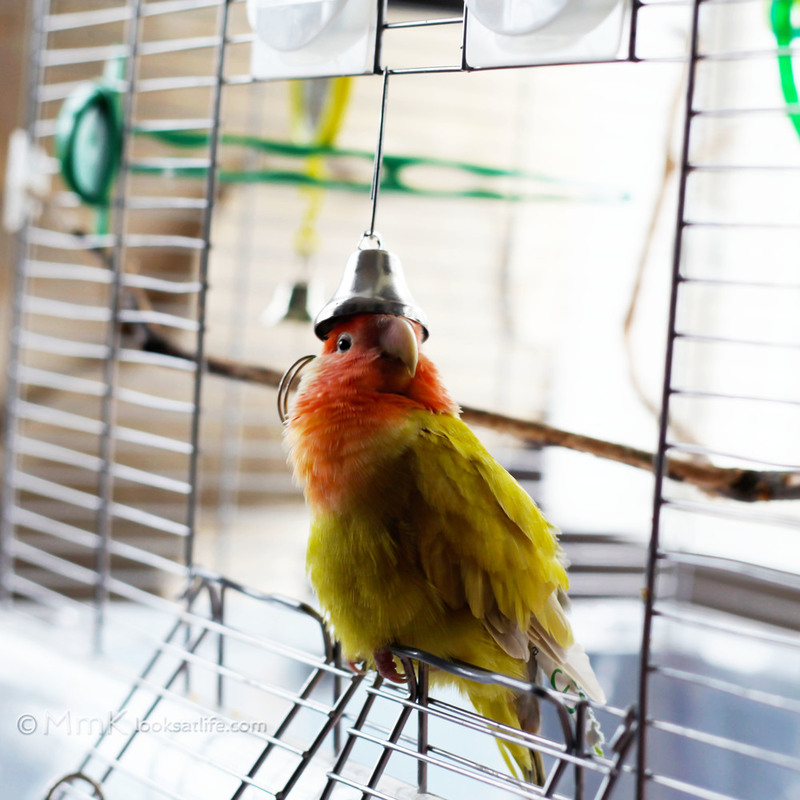 I don't believe in keeping birds confined in cages, so have tried to have semi free-bird lifestyles for my feathered friends. They have wings for a reason, and I like to respect that. 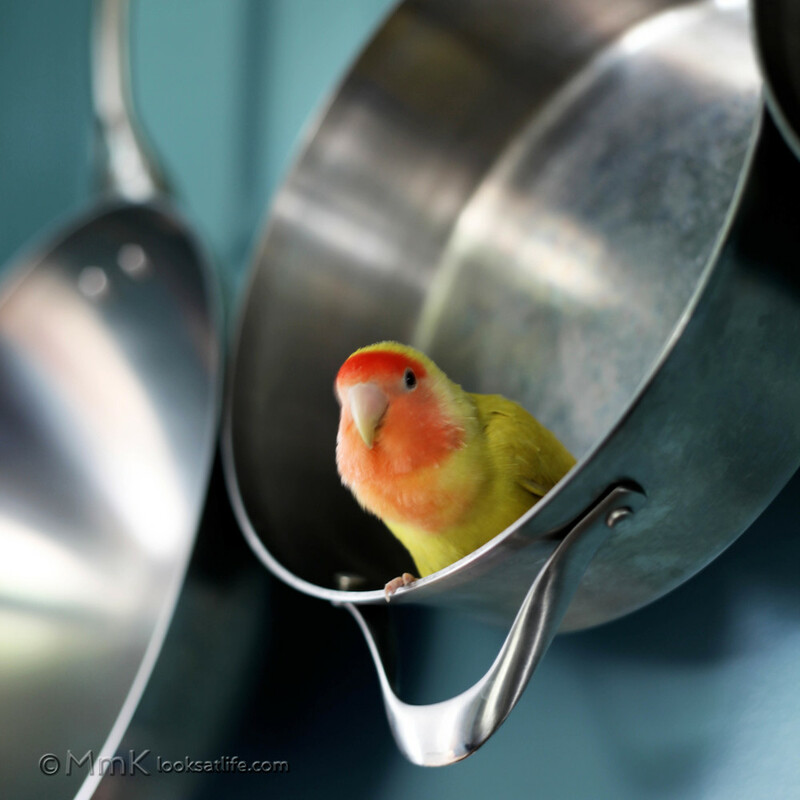 Birds are also super intelligent and once you move to the parrot species, you need to provide a lot of brain activities for them. If you can do all this, their personalities will flourish. And you will be amazed. Sometimes, you will be outwitted. It didn't take long for anyone who spent time with Peach to realize you couldn't trick her. She learned, and she learned quick! But back to her quiet two weeks. I was working from home at the time and thought maybe she needed some company and would like to hang out in her cage nearer to my desk. During a bit of a break, I opened up iTunes and thought I'd see how she felt about music. I played a variety of songs, but it wasn't until Lady Gaga came on that she made her first squeaks. By the time Macklemore was rapping, she was sitting on the edge of her doorway 'singing' at the top of her lungs. After that day, she didn't stop making noise and making her presence known to anyone who entered her surroundings. Peach had a mind of her own, opinions of her own, and territories of her own (which usually comprised of spaces like cupboards that we needed to use on a daily basis). She had different relationships with those whom she spent a lot of time with. I was an equal, Angel was a leader, grandma was a buddy, grandpa was fun to annoy, and Porter (our pug) just amused her. To Porter's luck, Peach mostly watched from afar. 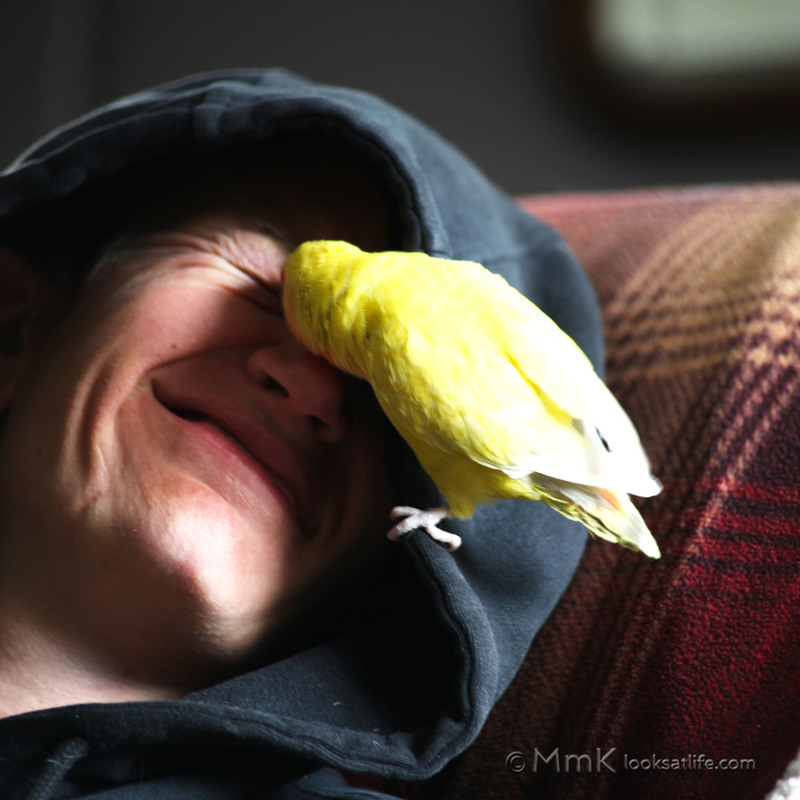 Porter had a contentious relationship with our previous budgie, Pumpkin, who used to try to snuggle and groom her. She was terrified of this tiny creature. However, Peach just wanted to chase a squeaky toy from time to time, or drink from her water bowl, or, when she really needed some amusement, sit on her back and take a ride! Generally, it took her a while to warm up to anyone new who came around. The best example was when the plumbing in our house was being redone. The plumber was in and out of our basement for three days, while Peach watched his comings and goings from the front living room, and eventually the kitchen which was closer to the downstairs. On the third afternoon, the plumber came upstairs to ask if I'd turn on the kitchen faucet. I was chatting with him for a minute or so before I noticed Peach sitting on his shoulder, all happy like this was her new best friend. Apparently, she was finally comfortable enough or curious enough to take it upon herself to fly down to the basement and see what he was up to. I was none the wiser to her absence upstairs. Mind of her own. Peach taught me that language isn't needed for communication. She had different sounds for everything. When she was happy and content - like when she'd get into her hanging snuggle hut at night - she'd give a little "grrr" sound. She'd make multiple happy squeals of delight when she found the perfect cupboard or tiny space she could hide away in all day. She talked back like a belligerent child if you teased her too much, and would give an in-your-face "RAWR" yell. And she used a high-pitched-alarm "beep" when she was scared or upset. One day she watched Angel use an oven mitt to go on a fly killing rampage. Peach didn't make any noise while this was going on, but just kept her distance and periodically flew out of the room. A couple days later, I pulled the oven mitt out of the drawer to use as an oven mitt this time. Peach was nearby and when she spotted it, she started beep-beep-beeping at the top of her lungs! She obviously remembered quite well what that mitt was previously used for. And this reminded me of what a smart and sensitive being she was. Peach loved buttons and little things she could pick up and throw on the floor. She couldn't get enough of drawers, bags, bookshelves, and boxes full of stuff she could create chaos in. Baths were taken in bowls, freshly poured glasses of water (for the humans), and sinks under a running faucet. She'd get so wet she could barely fly. If she caught you wearing a hoodie... well, you'd have a passenger tucked inside the hood for a while, squealing out with joy from time to time for finding the ultimate hiding spot. She'd sit on windowsills and call to us constantly when we went outside... lest we forgot about her (impossible). Sometimes I could hear her a block away when taking Porter for a walk! She started eating 'take-out' style, grabbing a seed or piece of fruit and eating it either on your shoulder or on your head. Many a time I would leave the house with shelled sunflower seeds tangled in my hair. Electronics were also a fascination with her: TVs, cell phones, and laptops. I have a loose W key on my keyboard as a little reminder of her zest for picking at things. She was continuously on the go from sunrise to bedtime, which kept anyone in charge of her care on the go as well. But, it was all worth it for such a fun companion. There is an unbelievable amount of love in the hearts of lovebirds. Peach showed that to all of us every day of her life. Yes, we fought at times (usually because I realized she had outwitted me on something yet again) but after the moment passed, all she would want to do was make things better. Snuggles and kisses - on the lips - were peace offerings. So was sitting on your knee, looking at you with cuteness. Sometimes, kisses were used as a distraction, like if she knew I had to leave the house for a while. Or if I was cleaning her home while she had eggs in the nest. She loved to be around her 'flock' and part of the goings-on in the day-to-day activities of our lives. She was a best friend, a loved one, and an essential part of my existence for too short of a time. Her passing in a tragic accident left me and everyone else who knew her heartbroken. She is missed every day so much. I know the emptiness can be filled with happy memories and the pain will eventually fade. I think the best thing I can do to honor her firecracker of a personality and life, is to remain curious and smart and as loving as possible as I move forward with mine. And maybe that was her lesson to teach. I know she has gone to where other Earth Angels we have all loved now exist. And hopefully, in some way, these beautiful spirits are looking out for us.